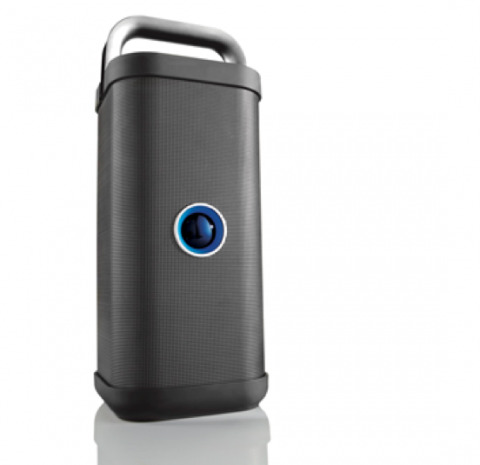 Recalled Big Blue Party wireless indoor-outdoor speaker. Consumers can contact Brookstone toll-free at 866-576-7337 any time or online at www.omnimgt.com/BrookstonerecallFAQ/ for more information. The speakers were sold at Ace Hardware, Bloomingdale's, Bon-Ton, Brookstone, Macy’s, Patriot stores and other stores nationwide, on the Home Shopping Network and online at Amazon.com, Brookstone.com, RueLaLa.com, Wayfair.com, Zulily.com and other websites from December 2013 through August 2018 for about $200.